Another month, another Vancity Box... and you guys, this one was amazing. I don't think I have been this excited about a subscription box ever. As you may recall, I recently introduced you to this new subscription box service for those of us living in the Lower Mainland of British Columbia. The concept is simple: supporting local businesses by introducing us to new brands and companies. Last month, the theme was food and drink. This month, it was handcrafted artisan items. To fuel my candle obsession (I burn them like crazy during the Fall/Winter months), I was super excited to receive a Fairview candle from Vancouver Candle Co. These hand poured premium soy candles are named after and inspired by neighbourhoods in the city, from Kitsilano to Strathcona and Gastown. I already have the Point Grey candle so was excited to add Fairview to my collection. It smells delicious with notes of grapefruit, peach, and red currant. In further scented goodness, this month's box also contained a Dilettante & Debutantes Lavender Vanilla Sugar Scrub and a Here & Now Botanicals Sweet Sassafras Aromatherapy Spray. Both products are perfect for when you really want to focus on some relaxing "me" time. And of course, for all us coffee lovers, a crochet coffee cup cozy from Hooked On Crochet. Mine was even personalized with my initial! 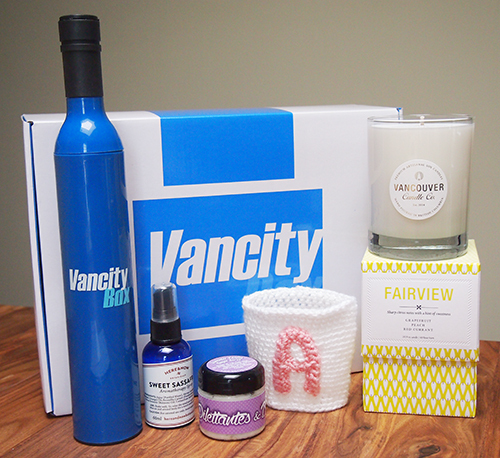 In addition to a calendar of events happening around the city each month, Vancity Box throws in a little branded swag with each box. Last month it was a reusable bag but this month it was an umbrella. You can't get more Vancouver than that! Plus, it's one of umbrellas that looks like a wine bottle with a cover so it doesn't drip everywhere. I was actually eyeing a similar style in a store a few months ago so it was kind of like the company read my mind here. Vancity Box costs $34.99/month + shipping (with cheaper options for longer term subscriptions). However, use my code ALISONELLE for $5 off until November 19! Ohh the box content looks amazing! The umbrella is so cool! I love that they included the candle in there. I've seen those around at Oakridge and it's so priceey. They all smell amazing though.